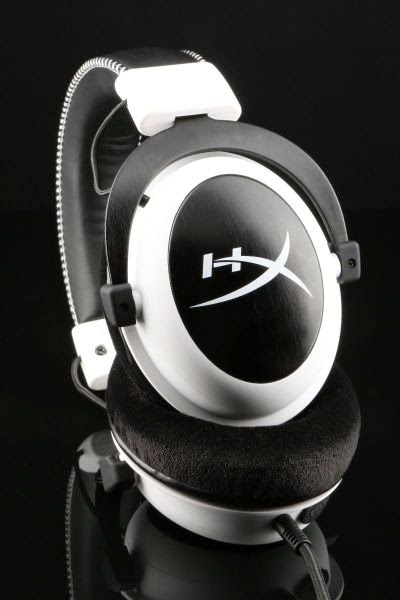 Fountain Valley, CA – August 13, 2014 − HyperX®, a division of Kingston Technology Company, Inc., the independent world leader in memory products, today announced the launch of HyperX® Cloud White Edition. It features a stand-out white and black color scheme and the same award-winning comfort of its predecessor, HyperX Cloud Black Edition. The headset offers memory foam ear cushions, a soft leather-padded headband and an over-the-ear closed-cup design to get anyone in any game comfortably for long game play sessions. HyperX Cloud White Edition delivers great audio performance with its large 53mm drivers so gamers can hear every word of dialogue, gunshot and explosion. The headset is versatile with its detachable microphone to make listening to music on smartphones and tablets easy and enjoyable with enhanced bass and crystal clear lows, mids and highs. HyperX Cloud White and Black Editions are compatible with PC and PS4™ as well as smartphones and tablets. It is the official headset of Intel Extreme Masters, Alliance Gaming, CNB e-Sports Club, SK-Gaming and Team Liquid. HyperX Cloud is backed by a two-year warranty and legendary HyperX reliability. For more information, please visit www.kingston.com/hyperxcloud. HyperX is the high-performance product division of Kingston Technology encompassing high-speed DDR3 memory, SSDs, USB Flash drives, and headsets. Targeted at gamers, overclockers and enthusiasts, HyperX is known throughout the world for quality, performance and innovation. HyperX is committed to eSports as it sponsors over 20 teams globally and is the main sponsor of Intel Extreme Masters. HyperX can be found at many shows including Brasil Game Show, China Joy, DreamHack and PAX. For more information visit the HyperX home page.